After a long wait, the flagship Nokia 8 has finally broken cover. HMD Global’s new flagship is an impressive beast with a premium design and solid hardware specifications. Nokia has used Series 6000 aluminum to craft the smartphone’s body, along with a glossy mirror-like finish that gives it a very shiny look. The Nokia 8 comes with a 5.3-inch sized polarized LCD display that offers 1440 x 2560 Quad HD resolution for a high pixel density figure of 554 pixels per inch. HMD claims the display used on the Nokia 8 can achieve a peak brightness of 700 nits, which certainly sounds impressive on paper. Protecting the Quad HD display is a layer of Corning Gorilla Glass 5. Like most 2017 flagships, the Nokia 8 too is powered by Qualcomm’s octa-core 64-bit Snapdragon 835 chipset with an Adreno 540 GPU. Even though the Snapdragon 835 doesn’t suffer from any major overheating issues, HMD has added a full-length copper cooling pipe with graphite shield to help dissipate heat across the full body of the Nokia 8. Unfortunately, HMD isn’t offering the Nokia 8 with more than 4GB of RAM as previously rumored. It comes with 4GB of LPDDR4X RAM and 64GB of UFS 2.1 built-in storage. While the Single SIM models get a dedicated microSD card slot for expansion, the Dual SIM versions feature a Hybrid slot, which means users will need to choose between expanding the memory and adding a second SIM card. At the rear, Nokia 8 features a 13MP + 13MP dual-camera setup with Zeiss optics. The dual image-fusion rear camera setup comprises of a color and a monochrome sensor. The primary 13MP sensor gets optical image stabilization, phase detection autofocus, and an IR range finder. Both sensors are paired with an f/2.0 76.9-degree ZEISS lens and a dual-tone LED flash. The Nokia 8 captures videos at up to 4K resolution with 360-degree spatial surround sound capture using OZO Audio technology. For selfies, the flagship smartphone includes a 13MP snapper with 1.12um pixel size, phase detection autofocus, and an f/2.0 aperture 78.4-degree wide-angle lens. While there is no dedicated LED flash, you can use the display as a flash to take selfies in low-light. 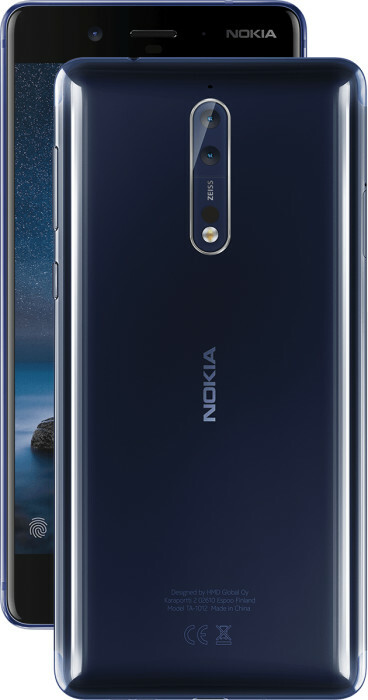 Nokia 8 also offers a unique feature called Dual-Sight, allowing users to livestream footage captures by the front as well as back cameras simultaneously to Facebook and YouTube. You can also capture photos in Dual-Sight mode. Connectivity options include Wi-Fi 802.11 a/b/g/n/ac dual-band MIMO, Bluetooth 5.0, GPS with A-GPS and GLONASS, BDS, NFC, ANT+, USB Type-C 3.1, and LTE Cat.9 with 3CA. Sadly, the battery inside the Nokia 8 isn’t particularly impressive when compared to other 2017 Android flagships. It ships with a 3090mAh non-removable battery with support for Qualcomm Quick Charge 3.0. Another highlight of the handset is that it comes with an IP54 certification, making it splashproof. As for the physical dimensions, the smartphone measures 151.5 x 73.7 x 7.9mm. In terms of software, the Nokia 8 will be shipping with Android 7.1.1 Nougat out of the box but HMD has confirmed that the device will be among the first to receive the Android O update. Apart from that, the Nokia 8 will also receive monthly Android security patches on a regular basis. 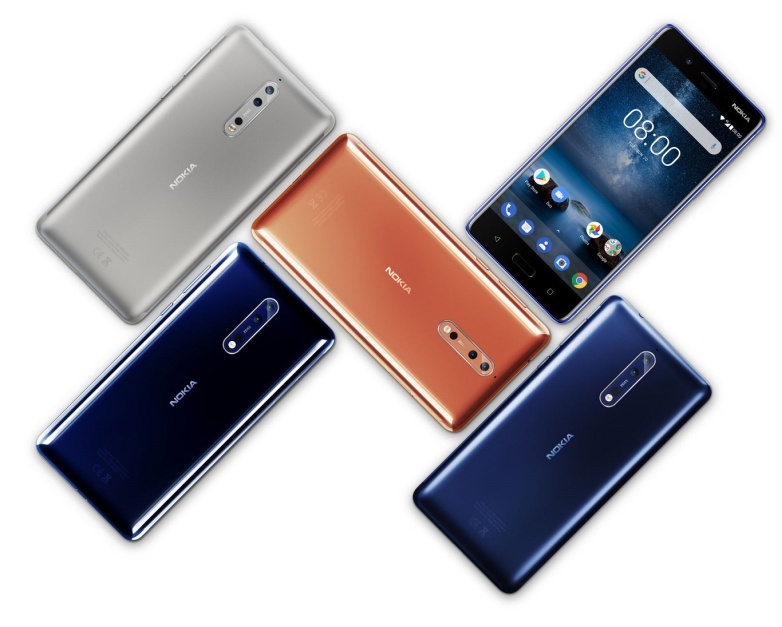 The Nokia 8 begins shipping in Europe early next month in four colors – Polished Blue, Tempered Blue, Steel, and Polished Copper. It has been priced at 599 EUR, which is slightly on the lower side when compared to devices such as Samsung’s Galaxy S8 and Galaxy S8 Plus. In other markets, HMD Global will begin rolling out the Nokia 8 early October onwards. What are your thoughts on the latest Nokia flagship? Leave a comment down below and let us know.